Whilst awaiting permissions and funds for other works, I thought I’d start work on our large iron gates and the accompanying gated door. What seemed like a nice little job to do outdoors in the nice weather, became a Herculean labour. First, I tested whether there was any lead in the paint. Despite several layers of old paint being visible, the test was negative. It seemed that someone had tried to renovate the gates before. Some parts didn’t have any paint on them, others had different levels of green paint and other parts were black. If the gates had started to be prepared for repainting, it was a long time ago as rust now appeared all over. I tried stripping but that seemed like far too hard work even on the flat surfaces, let alone on all the detail, so I switched to wire brushes in the drill and sanding tools. Even with power tools it was quite a job, particularly trying to access all areas of the rails and squirly ironwork. Being someone of a small attention span, I tired of it and so just did enough to have the parts that people were going to see more clearly (the higher areas were difficult for me to reach anyway) not bubble up or flake off after new paint was applied. Then another tour into all the gates surfaces and corners was required to clean. Another slow job as the old paint dust clung to the gates, reluctant to leave its home of many years. After a few days I had pretty much finished the preparations, when the weather turned and it rained every day for a week, following which I had to go away. By the time I returned the gates were again dirty and rust was surfacing in new areas. So I had to start the process again. Even with my shortcuts, it was a long time before I could start the undercoat. Despite being told in the shop how the paint goes really far, I found it didn’t and a new pot of undercoat was needed to finish the job. Of course, this happened in August: the traditional time for all of France to go on holiday at the same time. The shop I’d got the paint from was closed and being a specialist paint it was something only stocked by the few. The nearest other shops, still at a 45 minute and more drive, were also closed. The next was in the Jura: 1hr 20 mins away. They were open and had the product in stock. I had no option but to go. An internet order would take over a week and we were due some good weather for painting and I didn’t want to go through the whole preparation rigmarole again. I keep being surprised though. What I thought of as a necessary chore turned out to be a pretty little jaunt into different scenery. The landscape very gradually become more hilly, the air fresher, more cows in fields swishing their tails against the flies and the architecture turned into a mixture of the Bressane style brick and timber, and some chalet styles. 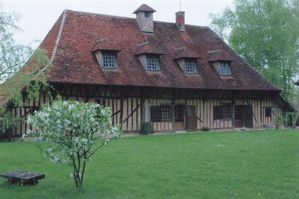 Bressane farmhouses tend to have long interrupted roofs that kink at ground floor ceiling height to extend out and provide a sheltered walkway, sometimes supported by posts making them look like ranches. From the lush greenery around, I think it’s safe to say that their main use is not providing shade from the sun. When it’s too hot here (which it was earlier in the year) the Jura will make a pleasant visit to cool down. Even so, next time I’m painting, I’ll make sure to order enough in advance and not start the work in August.